For today’s youth, life is filled with new choices, new decisions, new feelings, new perspectives, and new freedoms. During this time, teens are forming the belief systems that will influence their adult faith, and their ideas about the nature of God, the Bible, and the church. Will teen involvement in church youth programs provide them with a framework for making important choices? Will this time nurture values and encourage their emerging identities to be deeply Christian? Something wonderful can happen when you mix teenagers, the Bible, and an enthusiastic teacher together. Many teenagers are hungry to learn about the Bible, what it means, and how it can be applied to their lives. Traditionally, this type of education happens in Sunday School. Unfortunately, too many Youth Sunday School teachers are not prepared or feel inadequate when it comes to teaching teens. They do their best, but all they are doing is surviving the Sunday school hour. Help! 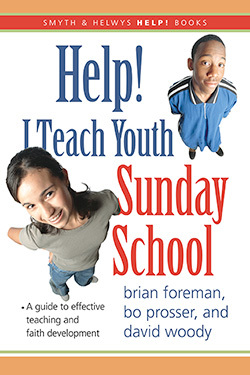 I Teach Youth Sunday School offers the Sunday school teacher specific tips and hints to prepare for and care for teens. Real-life stories are mingled with information on Youth and their culture, common myths about Sunday school, a new way of preparing the Sunday school lesson, creative teaching ideas, ways to think about growing a class, and how to reach out for new members while reaching in to old members. Brian Foreman is a youth ministry and social media consultant (www.b4manconsulting.com), as well as an adjunct professor at Campbell University Divinity School. His work with churches is designed to increase youth ministry tenure by supporting and educating both congregations and ministers. He and his family currently live in Raleigh, North Carolina. He is also author #Connect: Reaching Youth Across the Digital Divide. Bo Prosser is the Coordinator for Congregational Life with the Cooperative Baptist Fellowship in Atlanta, Georgia. He is a much sought-after speaker/trainer/motivator with churches, nonprofit groups, and business and industry. He is the coauthor ofBuilding Blocks for Sunday School Growth and Lessons from the Cloth 1 & 2. David Woody is the Minister of Faith Development at Providence Baptist Church in Charleston, South Carolina and has been involved with youth ministry almost two decades. He has written for Smyth & Helwys Intersection youth curriculum, the Center for Christian Education, and Unidiversity Youth Camp.